KIWI CASINO HAS CLOSED. LINKS NOW REDIRECT TO THE WILLIAM HILL SITE. Kiwi’s ‘Spin a Win’ is a mix of Wheel of Fortune and Roulette. Their pay table offers the best odds of the online wheel of fortune type games. Lots of bet options. Kiwi are a long standing and well trusted brand, owned by the William Hill Group. Kiwi casino runs on Playtech software, so you’ll find ‘Spin a Win’ rather than classic wheel of fortune. 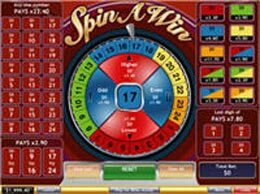 Spin a Win is a cross between Roulette and Wheel of Fortune, with only 24 slots and a massive variety of betting options. It’s got by far the best paytable of all the online wheel of fortune variants. The game screen is well designed to show all the betting options clearly. Kiwi Casino has been online since 2000. They were originally New Zealand owned but are now part of WHG, who also operate the William Hill gaming sites. WHG are registered in Gibraltar, licensed by the Gibraltar Licensing Authority and regulated by the Gibraltar Gambling Commissioner. Comments & Feedback on "Kiwi Casino Wheel of Fortune Review"
This great site plus the means anyone present is basically wonderful continue.